In a new study, Adrian Bejan, professor of mechanical engineering and materials science at Duke University, shows that a law of physics he penned more than two decades ago helps explain the evolution of passenger airplanes from the small, propeller-driven DC-3s of yore to today's behemoth Boeing 787s. The analysis also provides insights into how aerospace companies can develop successful future designs. In the case of commercial aircraft, designs have evolved to allow more people and goods to flow across the face of the Earth. Constructal law has also dictated the main design features needed for aircraft to succeed; the engine mass has remained proportional to the body size, the wing size has been tied to the fuselage length, and the fuel load has grown in step with the total weight. 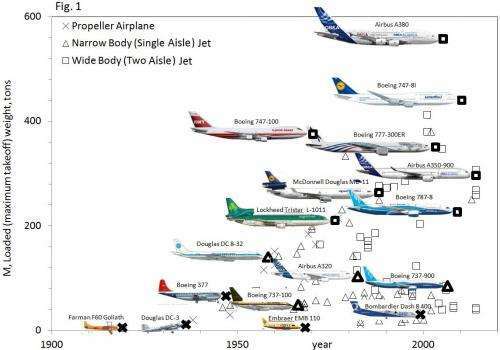 There was, however, one outlier on the chart—the Concorde. Perhaps that might apply for commercial aircraft, but does it apply for military, which are designed for different roles than commercial? Does it also apply for trans-sonic, super-sonic, and hyper-sonic designs? Politics ? USA & Co. went NIMBY on Concorde, especially when Boeing's plans flopped. Fuel ? IIRC, there was a *huge* hike in fuel price. What is the exact definition of "succesful commercial aircraft"? It's all too easy to say that Concorde was a "doomed aircraft". All right, one could hardly call it a "commercial" succes, but still, in its own way it was a "popular" aircraft. During air shows it still made everyone's head turn, even many years after its first flight. Concorde was not a commercial aircraft. Full stop. Built for political reasons, massively subsidized by the UK and French taxpayers, it has nothing to do with the aircraft in the diagram that were all built to make profits in the real business world. I wonder how this translates to warplanes. Are they sustainable? Re: "Evolution is a universal phenomenon encompassing technology, river basins and animal design alike, and it is rooted in physics..."
How is the unexplained universal phenomenon of "evolution" linked to physics, chemistry, and biology without first addressing the biophysical constraints on nutrient-dependent life that is controlled by the metabolism of nutrients to species-specific pheromones? Warplanes operate on a 'design for mission' basis. Different animal. They don't need to be comfortable, economical, etc. While range is always a factor, in flight refueling can and has modified the priority. Payload, speed, crew survivability, ability to satisfy performance envelope as required for the intended mission is what counts. No galley service, No drink carts. No in flight entertainment. Short take off/landing roll etc. "...JVK: Re: "Evolution is a universal phenomenon encompassing technology, river basins and animal design alike, and it is rooted in physics..."
How is the unexplained universal phenomenon of "evolution" linked to physics, chemistry, and biology without first addressing the biophysical constraints on nutrient-dependent life that is controlled by the metabolism of nutrients to species-specific pheromones?..." "evolution" as used in this sense refers to anything that changes and subsequent version are based on a previous version without resorting to a complete re-engineering or re-design. Non-replicating things require an engineer or designer. Your use of the term "evolution" refers to biological things which are self-replicating and as a result do not need a designer. Your use of the term "evolution" refers to biological things which are self-replicating and as a result do not need a designer. Self-replication is an interesting phenomenon that appears to integrate ecological variation and result in ecological adaptations, which are manifested in biodiversity due to nutrient-dependent pheromone-controlled amino acid substitutions that differentiate cell types in species from microbes to man. What experimental evidence of biologically-based cause and effect suggests to you there is no need for a designer? Dobzhansky (1973) appears to disagree with your conclusion that no designer is required. See: Nothing in Biology Makes Any Sense Except in the Light of Evolution. Link opens pdf: http://img.signal...nsky.pdf "I am a creationist and an evolutionist. Evolution is God's, or Nature's, method of Creation." Totally disagree, concord was a strategic design to appeal to a specific and well paying customer (for business deals between NY and London). As such it was very successful and only closed down because of the terrible PR of the crash and the overheads of lining all wings with flame proof material. That scientists can try out a thousand relationships between plane parameters and pick one where concord stands out, it is a classic case of retro-analysis and hindsight. Is anyone surprised that no-one wrote such an article before concord stopped running? Would the article have been published if concord was still running? So if some engineer comes up with an airliner design that is radically faster, cheaper, more fuel efficient, etc, sorry Charlie, it doesn't fit the chart. Even aircraft follow the law of the minimum: You can expand only to the limits of the least abundant resource. Currently that resource is the size of plane an airport can handle. The Concorde could well be a good design if you think in terms of a (near?) future world where only a small, hyper-rich elite can afford to fly - but don't really care how much a ticket costs if it means getting there fast. The chart works under the assumption that the change in the 'environment' is slow and without any obvious breaks. The chart might work for conservative planning (i.e. big companies like Boeing and Airbus). Big companies hate to take risks,as the payoff for the CEOs is minimal to non-existent if it works and hugely negative if it doesn't. 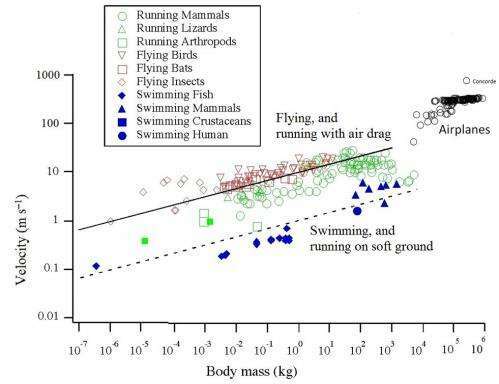 As Ray Kurzwiel proved, you too can be a "visionary" if you plot your data on log/log scales. The problem is that if you extrapolate outside the line you have drawn, you end up with weird predictions that may have no basis in reality. That's the problem here. The article does not describe the physics of this issue. It describes the results of many engineering projects using similar technologies with similar expectations of range and speed. So of course the Concorde is off the line. Whether it has a chance of making money depends upon what the market demands. That's an economic issue, not an engineering issue. Cost per ton-mile scales linearly with peak power for everything from a Piper Cub to the Saturn V.